Metalpecker Behold our version of the gravity-fed sliding woodpecker. 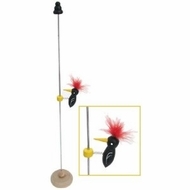 Ours is a 1-3/4" standard black woodpecker not counting his cute red plume slowly pecking his way down a 16-1/2" tall metal rod. His super-rapid lifelike pecking action is strangely compelling to adults and draws belly laughs from toddlers!